The September/October, 2006, issue of FGBC World, the all-Fellowship publication for Grace Brethren churches, is arriving in homes and churches this week. Here is promotional copy you may use for bulletins, newsletters, websites, and other church communications. Please pass along to your church staff. See the AGBM blog for distribution suggestions. Larry Everett of the Grace Brethren Church of Clinton, Maryland, remembers his “taste of hell” as a firefighter at the Pentagon on September 11, 2001. Read about how God answered the prayers of this man and has been working in his life since in the September/October issue of FGBC World, now available. Take a copy today or read it online at www.fgbcworld.com. More than 2,500 teens gathered at Biola University in LaMirada, California, for BNYC July 22-28. The “Rescue” theme for the conference was based on Colossians 1:13-14. Also, the Celebrate06 adult conference, held July 29-August 3 in Indian Wells, California, discussed the theme “Hearts on Fire.” Read more about what happened at conference this year and see the photos in the September/October issue of FGBC World, now available. Take a copy today or read it online at www.fgbcworld.com. Pike Grace Brethren Church of Johnstown, Pennsylvania, works with the Johnstown Grace Brethren Church to reach the inner city children through VBS. 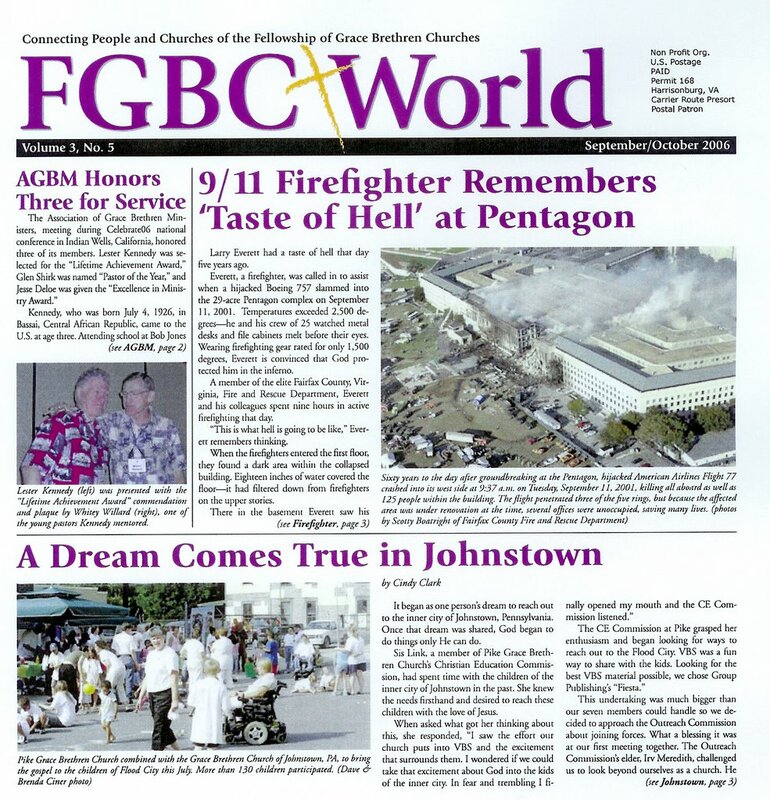 Read about what God did in and through both these churches in the September/October issue of FGBC World, now available. Take a copy today or read it online at www.fgbcworld.com.